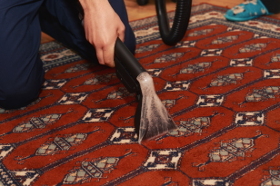 Our professional cleaners can deep clean any type of rug carefully as well as with a excellent result. The steam rug cleaning Wandsworth service is a highly successful cleaning method which usually is performed with a very hot water extraction machine which shampoos and rinses the rug, and also extracts up to 96% of the water out of the rug. For more delicate rugs, and those textiles which are not able to be treated using water, we provide a top quality dry rug cleaning Wandsworth service also known as dry compound cleaning that involves the use of specific dry cleaning foam and no water. Better Cleaning Company is a professional cleaning services company with the best preferred and most experienced rug cleaners Wandsworth SW. The rug cleaning services consist of the deep cleaning of all kinds of rugs, which includes: oriental rugs, delicate rugs and all other kinds of expensive rugs. The insurance coverage for our service along with rug cleaners is integrated in the set and inexpensive cost. The cost also contains the pre-treatment and elimination of most removable spills out of your rug. Upon request, we are able to apply Scotchgard safety or deodorizer to your rug for a much more stunning result after the deep cleaning service. If you want a clean and rejuvenated rug, purchase our specialized deep rug treatment service right now! If you need qualified and dependable rug cleaning Wandsworth SW at very reasonable prices, ensure you of the absolutely free and uncomplicated reservations method. Get in touch with our client care service daily. It is possible to do that by calling 020 3746 3201 or utilizing the web based contact form right here. We will arrive 365 days annually. We will make certain that all rug types washed are left in perfect condition. Huge will be given to almost all clients who the rug cleaning service with another one or much more of the services we offer. Those who reserve early on, as well as regular clients, estate companies and property owners from the region will receive our preferential costs for rug treatment too! Book right away!